A topknot prevents snow pellets from forming around her eyes. 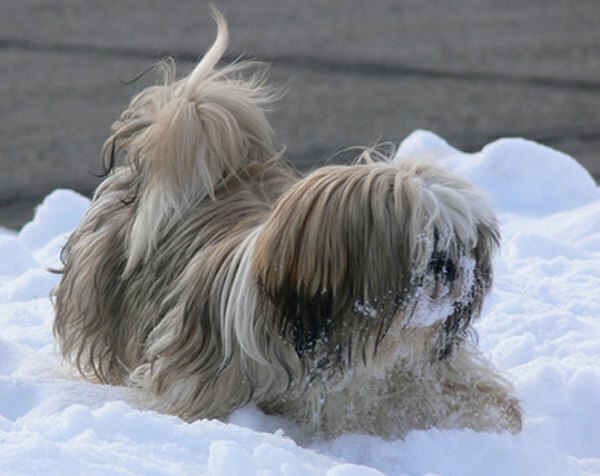 The traditional Shih Tzu show coat is long and flowing with a small topknot to keep the hair out of her eyes. 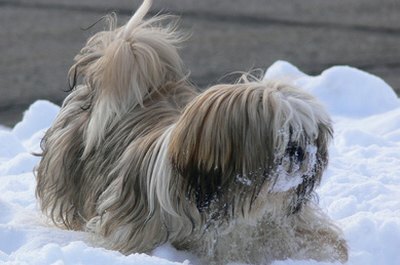 Because Shih Tzus don't shed as frequently as other breeds, their fast-growing hair requires regular care. A clean, well-brushed coat is essential before you begin making a topknot. Comb the hair on top of your Shih Tzu's head until it's silky smooth and free of tangles. Locate your pup's natural part by feeling for the tiny bump in the rear of her skull. This bump indicates the natural part that runs from your dog's head down her back to her tail. Gather 1 inch of hair from either side of the bump, and the 1 1/2 inches of hair in front of and behind that same midpoint. This section of hair indicates the parameters and size of your future topknot. Divide the entire section in your hand in two equal parts, with half the hair in the front and half the hair in the back. Wrap a silicone hairband loosely around the back section to hold its place. Unlike rubber bands, silicone won't tug painfully while you're wrapping it around your pup's hair. Secure the front section in a silicone hairband so that the elastic sits about 3/4 inch above your Shih Tzu's skin. Distance between the skin and the elastic prevents the topknot from being too tight and irritating your pooch. Remove the place-holding band from the back section and secure it using a silicone band, as you did for the front. The second section should be aligned so it sits 1 inch directly behind the first section. Wrap both ponytailed sections together by using a third silicone hairband. Fasten the third hairband 3/4 inch above the first two individual bands or the top knot will be too tight. For a festive flare, tie a bow around the topknot or clip a hairpin bow to the hairband around the front section. Praise and treat your dog for patiently letting you style her hair. Topknots take practice; don't expect yourself or your pooch to be professionals the first time. Remove the silicone bands with a pair of nail scissors instead of pulling them out as you would on a person. Yanking any type of hair elastic from your Shih Tzu's hair will cause severe pain and likely ruin your chances of doing any hairstyles in the future.